Save 42% or more off adult admission to top San Francisco attractions including unlimited Cable Car rides. With CityPASS, experience California Academy of Sciences, Blue & Gold Fleet's Bay Cruise Adventure, Aquarium of the Bay, and either Exploratorium or San Francisco Museum of Modern Art (SFMOMA), along with a 3-day Cable Car & Muni Bus passport. Not sure if these five attractions are right for you? Choose 3 of 8 iconic attractions and save up to 32% with C3 by CityPASS. Great for: Anyone who wants to see the biggest attractions and skip most ticket lines. Great for: Those looking for a select few attractions over nine days. Visit San Francisco attractions for one low price. Save up to 60% on top museums, tours, and activities, and pay nothing at the gate with an All-Inclusive Pass. Choose a 1, 2, 3, or 5-day pass. Go Card has more than 25 attractions available, including The Walt Disney Family Museum, GoCar San Francisco Tour, an Oracle Park Tour, the Asian Art Museum and more. Go Card also offers an Explorer or Build-Your-Own Pass, or pre-packaged options targeting Golden Gate Park attractions & the San Francisco Zoo, and the top museums. Great for: Visitors looking to enjoy San Francisco's top attractions, museums and tours at their own pace with the flexibility to choose as you go. Save up to 59% on more than 20 of San Francisco's popular attractions, including a variety of tours and dining. Available attractions include Bay City Bikes, Burger Bar at Macy's, Wild SF Walking Tours, the USS Hornet, the 7D Experience at PIER 39, and much more. Simply choose a 1, 2, 3, or 5-day pass and see all you can for one low price. The more you see, the more you save. A Sightseeing FLEX Pass option for 2, 3, 4, 5, or 6 attractions over 30 days is also available. Great for: All types of visitors. Choose as many attractions as you wish, or go unlimited. 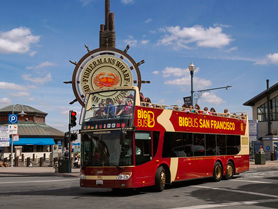 Bundle two popular tour options and save up to 18% on Big Bus San Francisco's Classic Hop-on Hop-off Bus Tour and Blue & Gold Fleet's San Francisco Bay Cruise Adventure Tickets. They're better together! Great for: Visitors interested in a hop-on, hop-off bus tour and bay cruise. Find tickets to individual area attractions, tours, cruises, and much more at significant savings through SF Travel. Available attractions include Big Bus Tours, a PIER 39 Attraction Pass, Exploratorium, The Walt Disney Family Museum, SFMOMA, an Oracle Park Tour, Aquarium of the Bay, and Blue & Gold Fleet, a Segway Tour, Winchester Mystery House, an All About Chinatown tours, and many more. You can even purchase a pre-paid BART transit voucher. Great for: Visitors interested in flexibility of experiencing individual attractions.